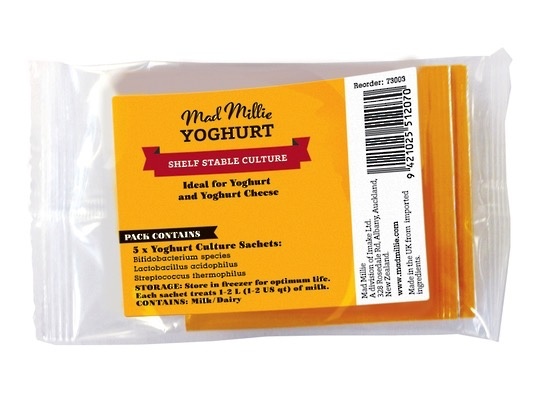 This yoghurt culture is a freeze dried yoghurt culture ideal for making yoghurt and yoghurt cheese. Freeze dried mixed strain culture containing Bifidobacterium species, Lactobacillus acidophilus, Streptococcus thermophilus. 5 sachets in each pack, each sachet cultures 1 - 2 litres of milk. All Mad Millie culture contains a small amount of dairy. To make yoghurt, sprinkle a whole sachet of culture to warmed milk and incubate at 40 degrees for 12 hours. Sachet is sufficient to make 1- 2 litres of yoghurt. Our culture contains 100 MILLION probiotic bacteria cells per gram of yoghurt for up to 3 days after being made. The recommended daily intake is 1 million probiotic bacteria per gram of product, so our culture is well above the daily intake!! Shelf life is 24 months when stored in freezer. This culture lasts out of the freezer (at room temperature) for 3 months so will be fine during postage. However, we suggest storing cultures in the freezer as soon as you get them in order to prolong the life of the culture.